Sometimes cabinetry hardware can get overlooked but if you want your kitchen to look great, it’s essential! There’s more to cabinetry hardware than just knobs and pulls. Although those options are a big part of it, the details are what make the design truly unique and memorable. 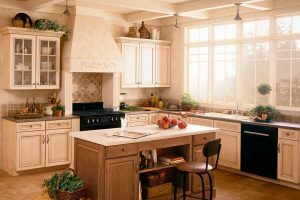 When designing your kitchen, these features are what pull the overall look together. Before you start your next project, consider these details when choosing the best options for your cabinetry hardware. Follow this guide and you’ll be well on your way to creating a cohesive look that’s both finished and unique. The options are almost limitless when it comes to the types of fixtures that you can choose for your cabinet doors. To simplify your options, you can first decide if you prefer the look of knobs or pulls. From that point, you get to the question of shapes and sizes. To answer these questions, consider the overall design of your room; whether you’re going for a rustic look or sleek and modern design; something vintage or even abstract. Knobs can be either solid or hollow, and usually come in round or oval shapes. While solid knobs feel sturdier and are more expensive, hollow knobs are lighter and great for printing textures and patterns. Pulls come in a variety of options, including handles, cups, bars, finger pulls, or bail pulls. All metal fixtures in your home have a certain finish that complements the color of the piece of furniture that they’re attached to. The same goes for cabinet hardware pieces. The options include dark choices like oil rubbed bronze and antique pewter, light choices including polished brass or copper, or shiny options like satin nickel or polished chrome. The details are what really make your cabinet design your own. You’ll have to consider the placement of your fixtures as well as if you’ll use backplates. If you’re taking on the project yourself, remember to measure the thickness of your cabinet door to ensure that you’re using the correct screw length. Measure and mark the intended locations and ensure that the drill bit matches the size of the screw. This entry was posted on Friday, December 22nd, 2017 at 2:20 pm. Both comments and pings are currently closed.